Well my grandma is writing the background of the doll, she asked me to sell it online or find a buyer for it so that what I will try to do for my grandma. Here is a short summary from what she told me today about the doll. This doll belonged to her grandmother and was passed down to my grandma. My grandma calculated the doll to be 150+ years old. My grandma just to have 5 other dolls which she sold around 20 years ago in an auction and she got upwards of $1000 for each, the ones she sold where bigger and not as old as this one. 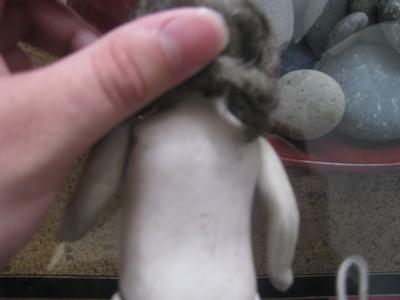 From the looks of the back of the doll it has a W with 2 dots on top of it and below the W i can barely read the last letters which I think are the last 3 which are RON or R0N not sure. 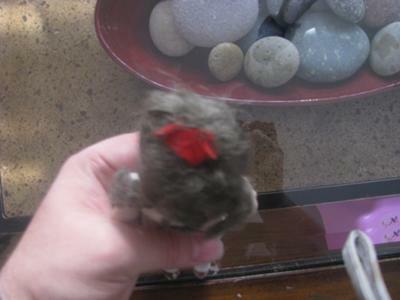 I will go to my grandma again tomorrow for the full story and background of this doll. I will upload the symbol of how the W is. Since you did not list how tall she is or show a close up picture of the face, from what I see she looks small (4"-6") with painted on eyes. Most of these are referred to dollhouse dolls made in Germany. DOES THIS DOLL HAVE MOLDED HAIR STYLE UNDER THE WIG? The glass eye models bring more money than the painted on eyes. 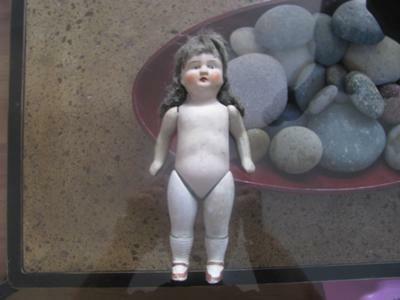 A lot are listed on eBay under bisque dolls, or German bisque dolls etc. Most are referred to being made in 1880, some earlier, some later. Due to today's economy, the doll market is poor and so you'll find dolls listed with no bids. Sorry but this doll has more sentimental value to your grandmother than monetary value.